CEREC truly is a huge step forward in dental technology that is found only in some of the most advanced dental practices in the world. CEREC (Chairside Economical Restoration of Esthetic Ceramics, or CEramic REConstruction) makes it possible for us to create a custom dental crown for you in only one visit! You can literally walk into our San Diego dental office and walk out the same day with a beautiful and durable new dental crown. Dr. Stephen Dankworth and Dr. Kimberly Corrigan-Dankworth have had fantastic results with CEREC dental crowns over the last few years. We’re proud to be on the leading edge of dental technology and offer the best quality dentistry available to the wonderful people of the North San Diego community. CAM (Computer Aided Manufacturing) and CAD (Computer Aided Design) digital technology makes CEREC treatments possible. Dr. Dankworth will start the procedure by using a specialized scanning camera that creates three-dimensional images / digital models of your tooth or teeth. 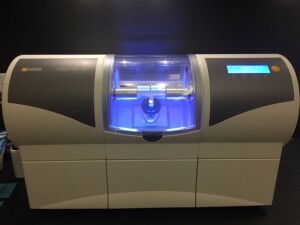 This scan is then utilized in the CEREC milling machine to exactly replicate your natural tooth crown (that was scanned) from a highly durable and natural looking block of fine ceramic composite. FAST | Believe it or not, it often takes less than 20 minutes for our CEREC machine to create your new dental crown. Seriously! You can literally walk into our office and out with a beautiful new smile enhancement in one visit. BUDGET | You may suppose from what we have shared with you that the CEREC treatment is expensive. No so. CEREC dental crowns are surprisingly affordable. LONGEVITY | The special ceramic composite used for our CEREC restorations will last a LONG time. If properly cared for, your new CEREC crown may outlast you. CONVENIENCE | We understand how busy our patients are. One reason we are so please to offer CEREC is so our patients only need to schedule one visit to take care of their dental crown needs. No more need for multiple visits! If you are interested in learning more about CEREC dental crowns, call, text, or contact us using the form on this page to schedule a visit to our Oceanside office. We help patients throughout the Fallbrook and Vista, CA area improve their smile quickly and easily with our tooth crowns.